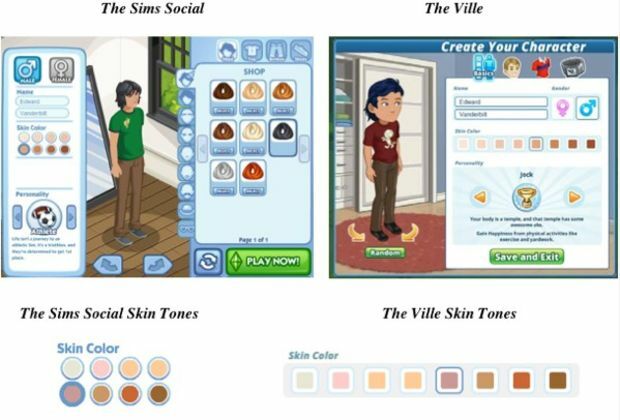 When I first heard that Electronic Arts was suing Zynga over The Ville, a rather blatant ripoff of EA’s The Sims Social, I was pretty excited to see the outcome. After all, there’s nothing worse than a company whose only business model is to steal the works of small game developers, and given some of The Ville's obvious lifts, it seemed as though EA had a very solid case. Thing is, the laws regarding which aspects of a video game are covered by copyright are actually quite fuzzy, and unfortunately, EA and Zynga have settled the matter out of court, failing to establish the precedent so badly needed in this legal gray area. Just one look at the app store and you'll find hundreds of blatant clones, quick hack jobs thrown together to capitalize on the success of other popular games. Though if you dig deeper into the history of the industry, it becomes obvious that ripoffs have been a big part of the gaming industry since its very beginning. So, as a bit of a history lesson, here are five of the most notorious game ripoffs of all-time. When Super Mario Bros. first released in 1985, it revolutionized gaming forever; the wildly successful game laid the foundations for the side-scrolling platformer and showed off just how powerful Nintendo’s Famicom system was. In fact, the Famicom was actually more powerful than many home computers of the time, something made very apparent by Hudson’s disgustingly ugly PC port of Nintendo's most famous game. Who needs sidescrolling when you've got screen flicker? 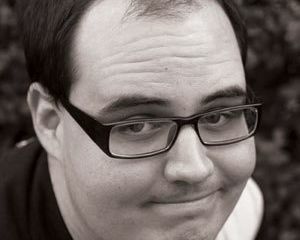 Interestingly enough, though developers eventually figured out how to make sidescrollers work on the PC, by that point Nintendo was no longer interested in porting their games, even turning away a spot-on a Mario demo put together by id Software (who would go on to use the technology in Commander Keen). So, with PC gamers eager for their own Mario game, it seemed obvious that someone would eventually come along with a simple clone to help fill this hole in the market. What people didn't expect is just how blatant they'd be about it. See, Time Warp Productions might’ve almost gotten away with cloning Mario if they’d had the sense to not make their lifts so painfully obvious. Despite some minor graphical changes (diamonds instead of coins, owls instead of goombas), The Great Giana Sisters looks exactly like Super Mario Bros. In fact, the first stage of the game is an almost perfect copy of the first stage of Mario, with the few extra pits thrown in before the final flag not enough to fool Nintendo's copyright lawyers. See, our warp pipes are orange. It's a totally different game. Though Nintendo never took any legal action against Time Warp, they did make it very clear to retailers that those continuing to peddle this blatant Mario clone might find their orders for Nintendo product going strangely unfulfilled. As a result, the game was quickly removed from store shelves, and is now quite a desired item for Atari ST and Amiga collectors. However, the strangest thing about The Great Giana Sisters is that this strange, forgettable clone survived to the modern age. While as recently as 2009 the series was still ripping off Mario, the latest Giana Sisters’ game was actually a wholly unique puzzle/platformer. Though the series will likely always carry the stigma of having ripped off gaming’s most beloved franchise, it’s definitely interesting to see a series finally trying to find its own identity. Though Square (now Square Enix) has earned a reputation as one of the finest purveyors of RPGs (at least until Final Fantasy XIII…), there was a time when this fledgling game company was barely a blip on the radar. 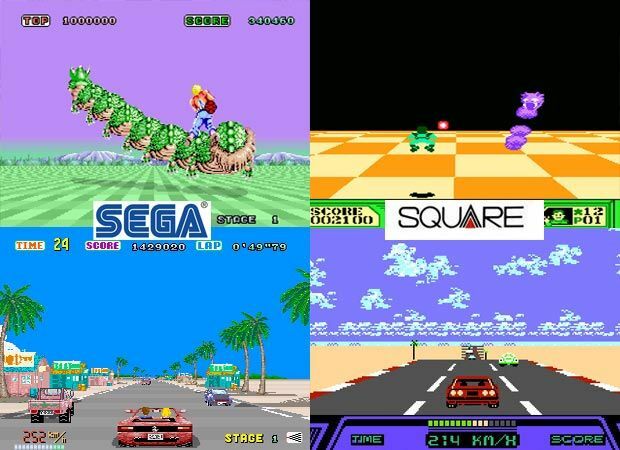 It wasn’t until Square got approved to develop games for the original Nintendo system that they really got to work… ripping off Sega. See, in the mid '80s Sega had some of the most popular arcade games around, but the home ports were only available on their own Master System console. Square saw the chance to cash in with some quick clones and capitalized on it. One of their first releases, 3D World Runner, was a terrible ripoff of Space Harrier which kept most of the action on the ground, only letting you fly around and shoot dragons (see: the fun parts) during the tragically short boss battles. Not long after came Rad Racer, a blatant copy of Sega's arcade racer Outrun, which, despite being a minor hit, wasn't enough to pull Square's revenues out of the red. 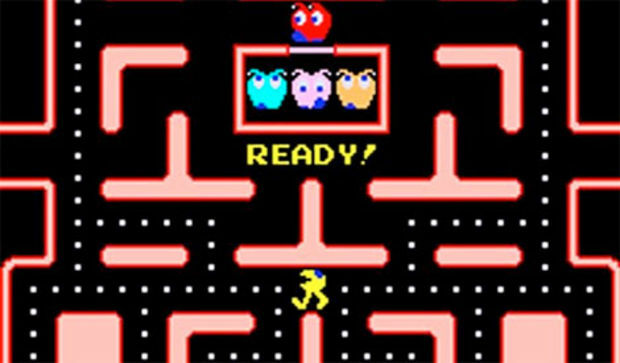 When Pac-Man first hit American arcades in October of 1980, the little yellow circle immediately began gobbling up not just power pellets, but quarters as well, quickly becoming one of the most popular arcade games of all time. Given this wild success, North American distributor Midway was eager to put out a sequel, though the developers at Namco were strangely dragging their feet. Around this same time, three young programmers were realizing the potential market for arcade conversion kits. Arcades were constantly purchasing new games in order to keep players interested, but each new machine was a risky investment, as a bad game might not bring in enough money to cover the cost of the machine. Conversion kits were the perfect solution, letting arcade operators upgrade games that they already knew players would like, while costing much less than a new machine. 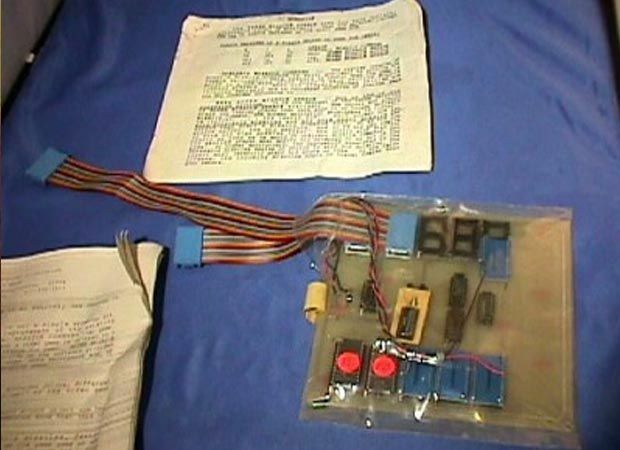 The trio quickly formed the General Computer Corporation (GCC) and set to work making plug-in boards. The original Plug n' Play game. Unfortunately for the boys at GCC, their idea wasn’t too popular with arcade manufacturers, who stood to lose plenty to this new technology. Atari was the first to react, taking GCC to court over Super Missile Attack, a mod of Missile Command. Though the two parties settled, GCC realized it could be fairly risky to continue with their new venture. However, they’d already sunk much of their time into a ripoff of Pac-Man, called Crazy Otto. With nothing to lose, they decided to see if Midway would consider buying their mod. See, it's like Pac-Man with legs! Totally new! What happened next is gaming history. Midway liked Crazy Otto so much they actually signed a deal behind Namco’s back, rebranding the game as Ms. Pac Man and quickly releasing it to arcades. Though Namco’s own sequel, Super Pac-Man, would release later that same year, the souped-up ripoff of the original Pac-Man’s code was the better game by far. What’s even more interesting is that GCC would later take Midway to court over their game Baby Pac-Man (a similarly unauthorized sequel), claiming they were originally responsible for the idea of a Pac-Man family. I mean, it’s one thing to ripoff a game, another to have your ripoff become the game’s official sequel, and another entirely to sue the company who helped make your ripoff an official sequel because they liked your ripoff so much they started making their own ripoffs based on it. GCC makes laser printers now, which seems like a much less confusing industry. If you think you're sick of seeing crappy Angry Birds merchandise littering your local shopping mall, imagine how the developers of Castle Clout must feel, having devised the simple game formula which has now made Rovio millions of dollars in app sales and licensing deals. This ranks right below Decca Records not signing The Beatles on the "missed opportunity" list. 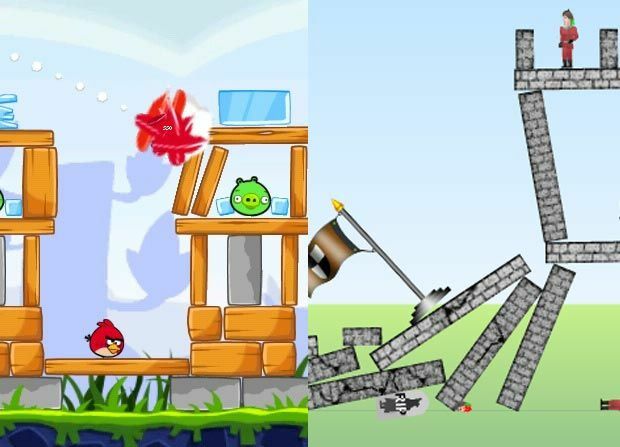 Though Castle Clout is definitely a bit rough around the edges, all the basic elements of Angry Birds are in there. Structures waiting to be toppled, various bad guys to be squished by the falling blocks, and a big catapult firing off a variety of projectiles. Though Angry Birds added some serious polish, and replaced the awkward catapult mechanism with some wonderfully responsive slingshot touch controls, at heart, it's still a clear evolution of this now forgotten flash game, and you hope they'd at least have the courtesy to send the guy a free t-shirt. 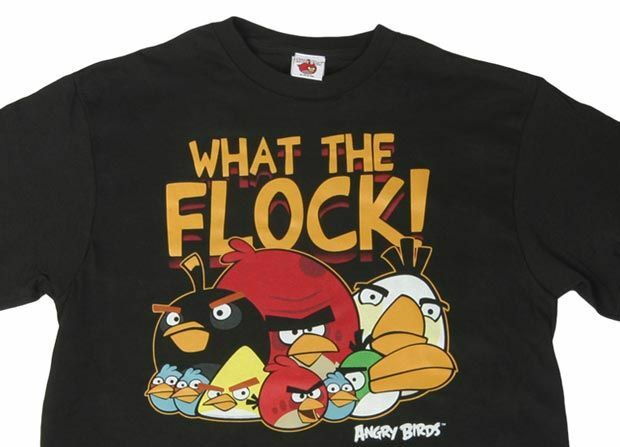 Thing is, it’s kind of hard to be upset at Angry Birds. After all, the mechanic of using catapults to knock down structures can be traced back to, oh I don’t know… the ancient greeks? If anything, the real moral of the story is that if you have a successful flash game, get that thing on mobile phones as soon as possible, preferably adding a bunch of crappy cartoon animal mascots to it, so you can later brand every piece of merchandise known to humankind. The Simpsons: Road Rage is what happens when you have the rights to one of the most successful television franchises of all time and zero total creativity. 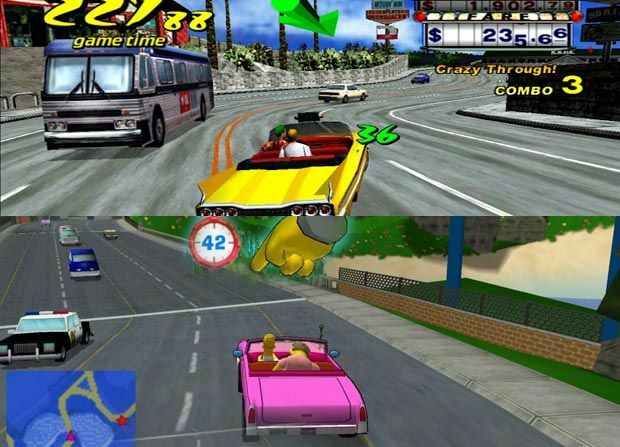 I like to imagine that someone in the planning meeting for this game asked, “Why would the Simpsons be driving taxis?” before being dragged down to the basement and bludgeoned to death with sacks of money. Remember, this is Electronic Arts: the same guys who invented a bunch of crappy original characters just so they could try to ripoff Marvel vs. Capcom. 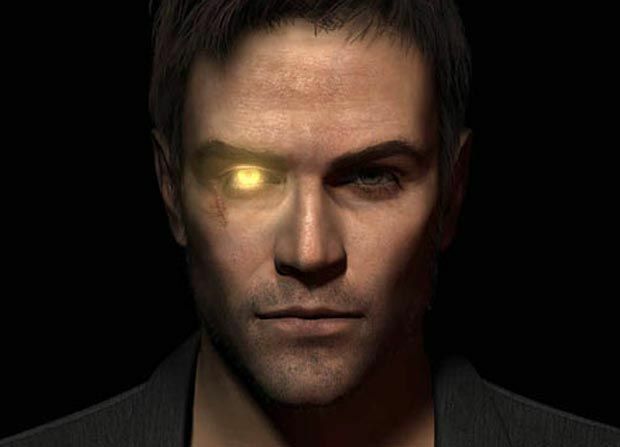 The same guys who wanted to make their own Goldeneye and came up with the idea of a guy with an actual golden eye. Point is, EA is full of dangerous psychopaths who care more about money than logic, and if they say the Simpsons are going to be driving taxis then you best shut your mouth and start programming. So, you might be wondering what makes Road Rage a notable ripoff. After all, there are plenty of crappy licensed titles which blatantly steal their ideas from other games, with The Simpsons having copied everything from Tony Hawk's Pro Skater to Grand Theft Auto without incident. See, our game has a hand instead of an arrow. totally new! 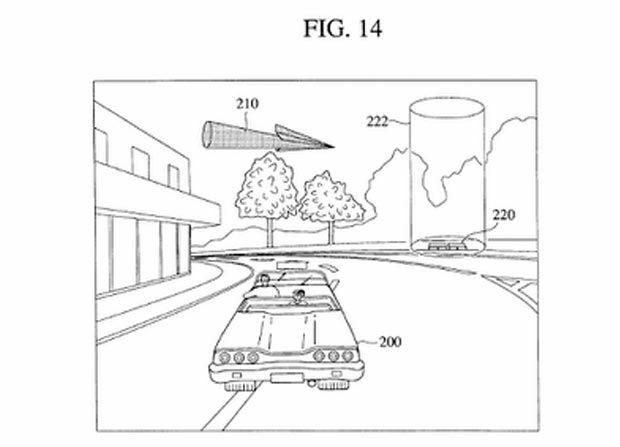 What Electronic Arts didn’t know is that, unlike the other developers they stole from, Sega actually owned patents on some very specific Crazy Taxi features. For instance: pedestrians that jump out of the way of a car, or giant floating arrows which show the player where to go. That’s right, Sega owns the rights to people not wanting to get hit by cars and arrows that point at things. They should’ve really pushed their luck and tried to get a patent for cars that drive really fast. Rather than take a chance on forfeiting all the money they’d made from the million or so copies of Road Rage sold, EA choose to settle the eventual lawsuit, much like they did this month in response to Zynga's counter-suit (saying it's okay that The Ville ripped off The Sims Social, because The Sims Social was ripping off CityVille to begin with). It seems that until a big company like EA decides to grow a pair and actually fight it out in court, small game developers are pretty much forced to accept that their original ideas will be endlessly cloned, as has been the case in this industry for decades now.